Today I have a special guest from the Ashtanga Yoga World. 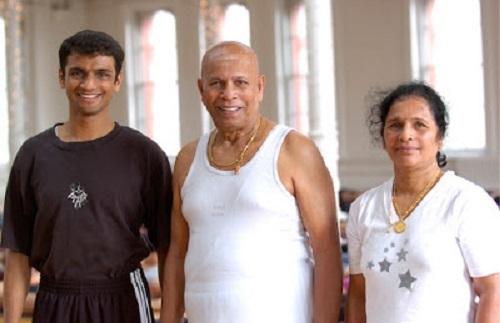 Here with us is Sharath Jois, Director of Ashtanga Yoga Institute, a grandson of Guruji Shri K. Patabhi Jois. Sharath was born on September 29, 1971, in Mysore, India to Saraswathi Rangaswamy, daughter of the Guruji. Sharath learned his first asanas at age seven and experimented with postures from the primary and intermediate series until he turned fourteen. I have the left knee pain. What is your recommendation, should I do my daily yoga practice with modifications? Sharath: Prayatna shaithilya ananta samapattibhyam - Yoga Sutra 2.47. Releasing the effort, not pushing so hard. You should practice, but you should be careful. Do not push too much until you feel better. You should go slowly, let the body change, and don’t rush it. Flexibility will come. When doing this practice, exercises and sports can make you stiffer and susceptible to injury. There is no need for other sports activity unless you really like it, and then, you can do that once in awhile. Injuries or pains that you get by asana, asana can heal. How yoga should be practiced? Yoga should be practiced as a spiritual practice. It’s not just like an exercise. If you do like that it has certain limitations. If you do it like spiritual practice, there's no limit for that. You can go higher dimensions and higher levels in this practice. So it's always good to practice thinking it's a spiritual practice and we should bring spirituality in our practice. That is very important. Instead of just doing it like exercise, aerobics, gymnastics. If you bring more spirituality in your practice, then I think it’s more effective. This whole practice will be more effective. So students have to bring that. I have my weaknesses - I am lazy and weak... What are the best ways for me? Whole practice is done to get rid of all these like I told you kama (lust), krodha (anger), moha (attraction), lobha (greed), madhya (pride), matsarya (jealosy) – these 6 enemies should be removed by practicing yoga. Once you get read of them which each and everyone has the light inside you, the liberation will happen. You get liberated from all these and nothing will affect you. The whole practice is based on that. That’s the main reason why we do the yoga practice. So I have to practice 6 days a week. What happens when I practice for an entire year? We become happier, we get peace of mind. We can get rid of lots of problems, both mental and physical. All over the world, there are people suffering from stress, Ashtanga Yoga gives us the strength to deal with it. I eat meat drink beer and wine. Do you consider me as committed yoga practitioner? To eat meat is to kill another being and that is the opposite of ahimsa, non-violence. When it occurs in nature it is a different thing - a tiger that eats meat does so without destroying the ecological system. Alcohol is against yoga because it will affect your inner peace and your practice. A child should be eleven years old to start practice, but there is no upper limit. Yoga will keep happening within you until you die if you keep practicing. When we reach a certain point in our practice, yoga becomes part of ourselves, part of life, like one of your arms. It cannot be removed. It's not possible to say: tomorrow I don't want to do yoga. That would be like cutting off your arm. Will every yoga practitioner eventually reach enlightenment? If they develop themselves it can happen. But first, you must allow it to grow inside of you. It is like planting a tree; you must care for, and nurture it, for the tree to grow. Our nurture is the physical, asana, practice. If we keep doing our practice right, samadhi can happen at any time, but we never know when. Sri K Pattabhi Jois said that "Ashtanga Yoga is for everyone, except lazy people"- But can some be too ambitious with their yoga? Many people are too ambitious with their yoga. But the yoga process does not happen instantly, it is a slow process. Today everyone wants everything right away, but yoga is not like that. Yoga takes practice to understand. It is like the ocean - you have to dive into it to understand. Otherwise, it's just water.